I have the perfect stocking stuffer for the beauty junkie in your life. essence cosmetics makes these wonderful little holographic lip glosses in different shades that are tremendously beautiful. They are called Holo Wow! Dewy Lip Shine. I have tried all 5 of them and agree that they are gorgeous. These little beauties are vegan, cruelty-free, gluten-free and contain so much shimmer that you won't know what to do with yourself. These come in 5 shades: Unicorn Powder (holographic white/pink), Butterfly Flap (holographic orange/pink), Scarab Wings (holographic purple/blue), Dragonfly Shimmer (holographic blue/purple) and Fairy Dust (holographic green/blue). My favorite is Scarab Wings because it goes on a beautiful plum color with holographic blue shift. All of them look gorgeous on though. These are beautiful colors and look even better over lip liner. They look nice alone. But, I would even wear them over lipstick too. There are many different ways that these can be worn. 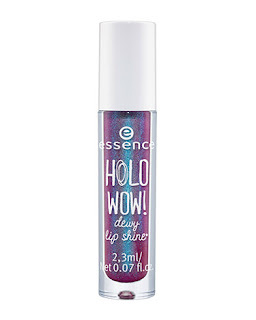 essence Holo Wow! Dewy Lip Shine is available from www.essencemakeup.com and www.ulta.com as well as Ulta Beauty stores. Like essence on Facebook: https://www.facebook.com/essence.north.americal; Follow essence on Twitter: @essencemakeup; Follow essence on Pinterest: http://pinterest.com/essencecosmetic/; Follow essence on Instagram: https://www.instagram.com/essence_cosmetics/; Subscribe to essence on YouTube: https://www.youtube.com/user/essencecosmetics and Follow essence on Snapchat: https://www.snapchat.com/add/essence-beauty.